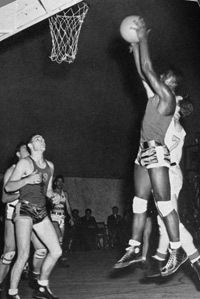 Jackie Robinson transferred from Pasadena Junior College to the nearby University of California, Los Angeles (UCLA), where he became the school's first athlete to win varsity letters in four sports: baseball, basketball, football and track. 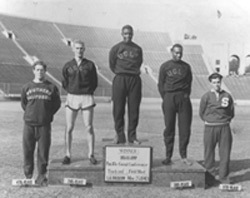 He was one of four African-Americans on the 1939 UCLA Bruins football team; the others were Woody Strode, Kenny Washington and Ray Bartlett. Robinson wore number 28 for the Bruins football team. Washington, Strode, and Robinson made up three of the four backfield players – a rarity for the time, when only a few dozen African-Americans played throughout college football. Belying his future career, baseball was Robinson's "worst sport" at UCLA; he hit .097 in his only season, although in his first game he went 4-for-4 and twice stole home plate. While a senior at UCLA, Robinson met a UCLA freshman and his future wife Rachel Isum, who was familiar with Robinson as an athlete from PJC. In the spring semester of 1941, despite reservations by Rachel and his mother, Robinson left college in order to alleviate some of his mother's financial burdens. 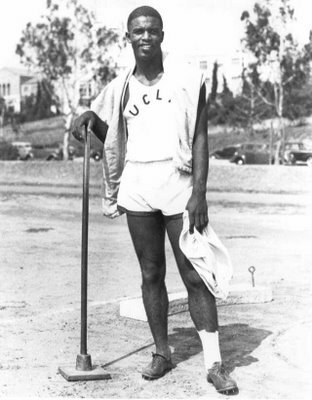 Robinson was the first four-sport letterman in UCLA history - football (1939 and 1940), basketball (1940 and 1941), track and field (1940) and baseball (1940).